When we last peeked in at model of manners and dapper dresser Mister Dash, the mixed breed pooch was saving Madame Croissant's rambunctious granddaughter Daphne from a Radio Flyer accident in Merci Mister Dash! Happily there's a brand new Mister Dash adventure on shelves and it involves tantalizing cupcakes, the spirited but troublesome Daphne, more Dash heroics, and heaping servings of charm and laughter. Jauntily gorgeous illustrations by Esperança Melo are the perfect match for Monica Kulling's (author of Lumpito and the Painter from Spain and Tundra's award-winning Great Idea series) warmly dynamic story. 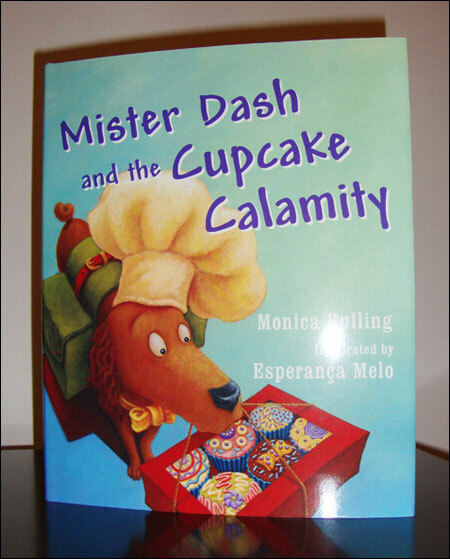 The delightful combination is bound to make Mister Dash and the Cupcake Calamity a favourite with youngsters. Kulling has a winning hero in the fastidious but loyal Dash, who plays delivery dog for Madame Croissant's bakery business even as he feels foolish in the baker's hat, and I hope we have many more Mister Dash adventures to look forward to.